Lisbon is probably the least known of the European capitals but is one of the most interesting and intriguing. In the 18th century there was an enormous earthquake which all but destroyed the old city and the architecture you see now dates from that time, though traces of the old buildings can still be seen in the Alfama district, which is medieval and Moorish. 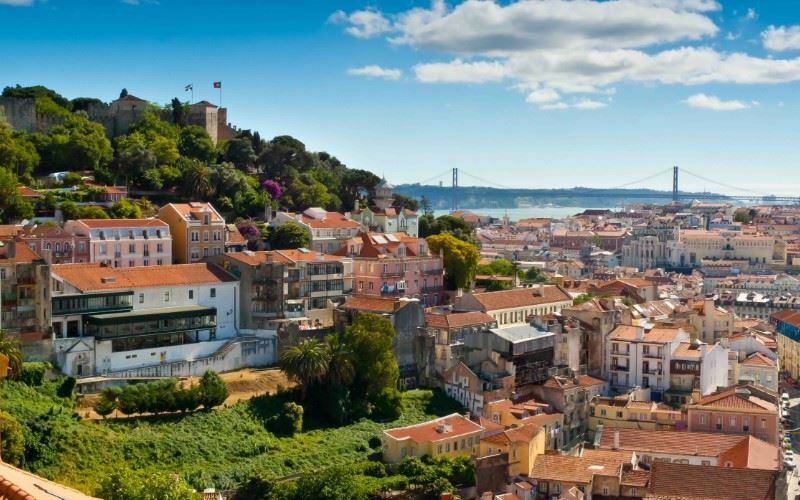 Lisbon is built on seven hills and has splendid views over the whole city that can be had from the old Moorish castle of São Jorge. This is a compact city, easily walkable with good restaurants and plenty to see and do. Arrive at Lisbon airport and transfer to the 4-star Heritage Avenida da Liberdade Hotel in Lisbon. This charming property is located at the heart of the city and within walking distance of many of the main sites and shops. Overnight at the Heritage Avenida Liberdade Hotel, Lisbon. Days at leisure. Opportunity to visit and explore some of the main sites of Lisbon. The hotel is well located on the main avenue of the city and the central Rossio Square and the districts of Alfama, Baixa and Belem are all within walking distance. Whether you want to shop or visit museums, Lisbon has it all. After breakfast, make your way to the Europcar Lisbon downtown office to collect your rental car. Drive to the outskirts of Evora (c.75 minutes), and check-in at the 5-star Convento do Espinheiro Hotel. A complimentary guided tour of this historically important monument and home of Portuguese royalty is included. The Convento, set in the countryside but close to Evora, offers a complimentary return taxi service into the royal town which is classified as a UNESCO World Heritage site. The hotel has excellent spa and health facilities which are at your disposal. Time to explore Evora, the oldest town in Portugal with over 20 churches and beautiful religious architecture. You will notice a style characterised by a twisted rope decoration, called Manueline, which is Portuguese late Gothic and dates back to the 1500s. Marble doors and window frames are common in the area. A visit to the Bones Chapel (Capela dos Ossos) is a must for any visitor. This Franciscan Chapel has walls that are literally covered with human bones, including skulls, removed from tombs by monks. In the evening enjoy a complimentary wine tasting in the hotel’s spectacular vaulted cellar. The royal town of Estremoz is an hour’s drive from the Convento. Visit the hilltop castle and the fortified walls, the churches and the pretty little streets with shops selling local products. The nearby hillside winery of Encostaz de Estremoz, from where Estremoz can be clearly seen is only a short drive away. The winery’s restaurant is well known for its good local cuisine. The restaurant has floor-to-ceiling windows allowing a fabulous view of the sun setting over the vineyards. On your return, make a stop at Evoramonte (c.15 minutes), located between Estremoz and Evora, a medieval village with tiny, peaceful streets surrounding the castle. There are excellent panoramic views from the top of the tower. After breakfast, head west towards the Spanish border and the village of Monsaraz (c.1 hour). This pretty hilltop, fortified town offers some fabulous views over fields, vineyards and the Alqueva Lake – the largest artificial lake in Europe (c.96km long). There is a medieval castle, cobbled streets and white-washed houses. To the north is Vila Viçosa (c.70 minutes drive), where the Royal family of Bragança lived, with its impressive Palacio Ducal and Palace Square. Do not forget the complimentary spa/health club facilities including indoor and outdoor pools once you are back at the hotel. Drive to Lisbon for your flight home. The hotel is situated on the majestic Avenida da Liberdade, from which the hotel takes its name. This charming property is located at the heart of the city and within walking distance of all the main sites and shops. The hotel is situated on the majestic Avenida da Liberdade, from which the hotel takes its name. This charming property is located at the heart of the city and within walking distance of all the main sites and shops. Housed within a beautiful 18th century building, the hotel has been carefully restored and many features retained including the original exterior. Inside, the décor successfully combines the modern and the traditional - the result is a warm and homely environment. The junior suite interconnects with a superior room. Note: A city tax of 1 Euro per person per night is payable locally. Children under 13 years are exempt.